8% of the daily requirement for Calcium. 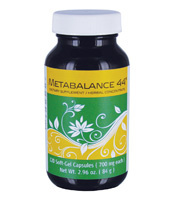 Metabalance 44 is so much more than a typical multivitamin. In this advanced formula, the vitamins are attached to whole foods such as beet roots, alfalfa, parsley, and bee pollen. Soy lecithin, wheat germ oil, choline bitartrate, inositol, paraamino benzoic acid (PABA), potassium citrate, betaine hydrochloride, L-lysin monohydrochloride, L-glutamic acid, bee pollen, flaxseed meal, hesperidin complex, lemon bioflavonoids, rice bran seed, rutin, beetroot powder, alfalfa concentrate, bromelain, parsley, and papain. 2 MetaBalance 44 whole food multivitamin capsules at meal time, 1 - 3 times per day. MetaBalance 44 is an excellent whole food vitamin for pregnancy nutrition because it has all the necessary nutrients for healthy fetal development, including folate.